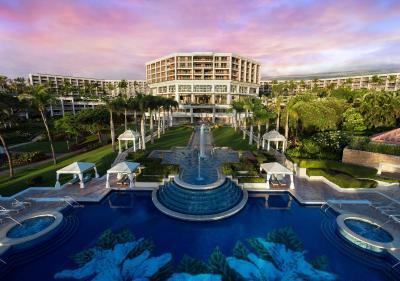 Lock in a great price for Grand Wailea Resort Hotel & Spa, A Waldorf Astoria Resort – rated 8.7 by recent guests! The hotel was very lovely pools and hotels were excellent! I loved the view the pools and the water elevator was amazabubbles and the staff were very polite and food and the smoothies are so good! heck when we got to the poll I didn't get out! Excellent location and on a great beach. Staff very friendly and provided great service. 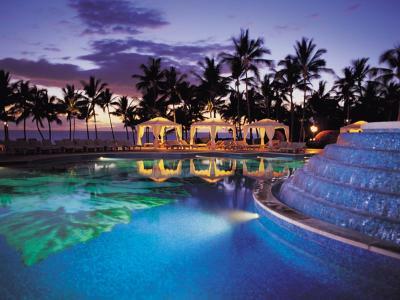 The Grand Wailea is gorgeous and the grounds are so beautiful, there are multiple pools for use and beach access. Very friendly and convenient but lack of knowledge from servers. Great beach, beautiful grounds, good food & shopping. Perfect location. 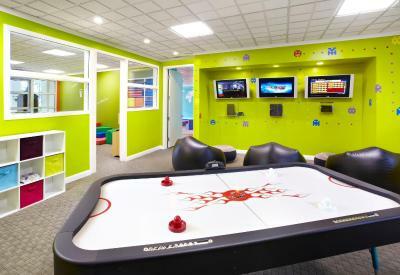 The property itself is gorgeous, with a beautiful design, huge layout and lots to explore. The rooms were comfy and spacious, the wifi worked well, the maids kept the room spotless. 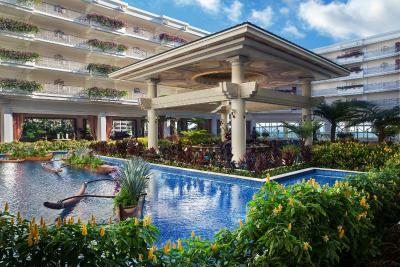 The pool is spectacular with a variety of swimming options, waterslides, grotto, and lazy river, and the beach is relaxing and fun to swim at. The staff were very friendly, with the exception of a few bad apples who were probably having a bad day. The pool was fun. We enjoyed dining at Bistro Molokini. We loved the bean bag throwing game. 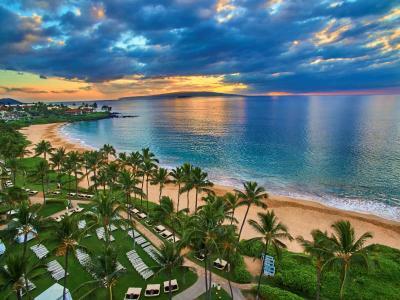 Grand Wailea Resort Hotel & Spa, A Waldorf Astoria Resort This rating is a reflection of how the property compares to the industry standard when it comes to price, facilities and services available. It's based on a self-evaluation by the property. Use this rating to help choose your stay! 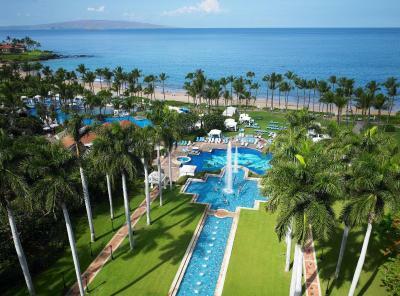 One of our top picks in Wailea.Located on 40 acres of tropical landscape on the white sand of Wailea Beach, the Grand Wailea Resort Hotel & Spa, A Waldorf Astoria Resort features 5 restaurants, a spa, a water park, and 3 golf courses. 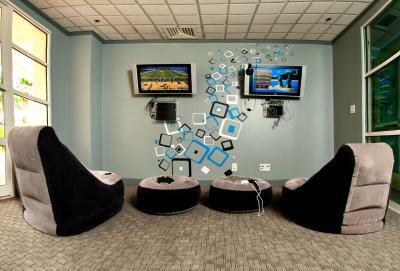 Guest rooms and suites feature free WiFi. 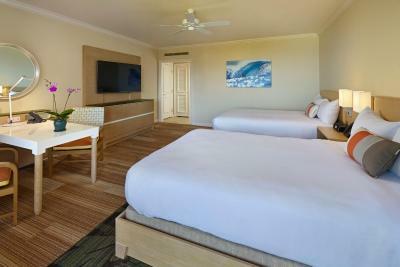 All spacious guest rooms feature privately furnished terraces with views, a flat-screen TV and premium feather duvets. Each private bathroom features Italian marble vanities, a deep soaking tub, plush bathrobes and slippers, designer toiletries, a makeup mirror and hairdryer. 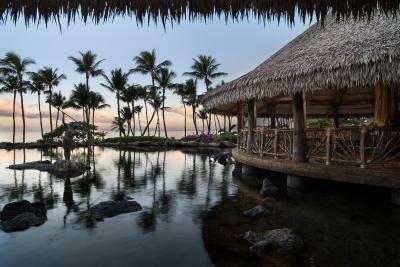 Humuhumunukunukuapua'a, a Polynesian thatch roof restaurant set over a romantic oceanfront lagoon, serves Hawaiian-influenced fish and meat entrees. 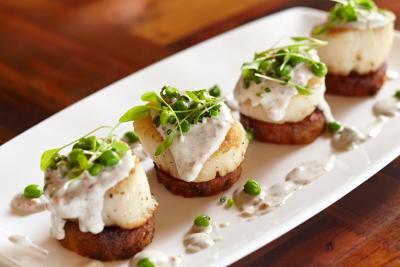 Bistro Molokini offers California and Island fare in a relaxing, open-air ambiance with ocean views. 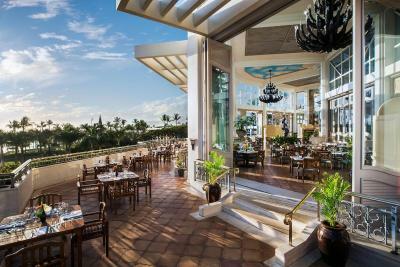 Café Kula provides Hawaiian food for breakfast, lunch, and dinner. ALAN WONG'S AMASIA highlights Asian fusion cuisine. A sumptuous daily breakfast buffet and Sunday Champagne Brunch with panoramic Pacific Ocean views is featured in the Grand Dining Room. 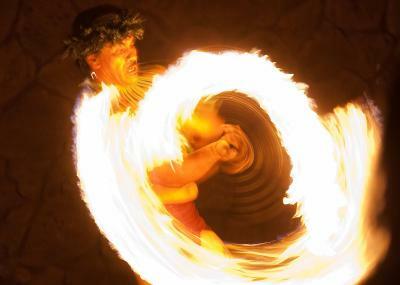 Guests can also dine at the Grand Luau of Honua'ula. 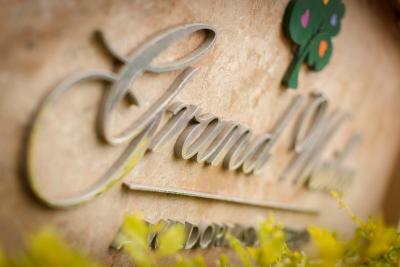 Spa Grande, located on site at Grand Wailea Resort Hotel & Spa, offers a wide variety of body treatments, massages and beauty services. A hydrotherapy bath circuit is also featured. 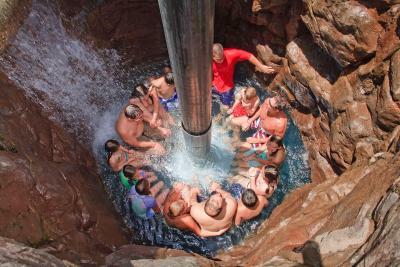 The Wailea Canyon water park offers 9 outdoor swimming pools connected by a lazy river and features a water elevator, water slides, waterfalls, caves, children’s pool, sand beach and a swim-up bar. 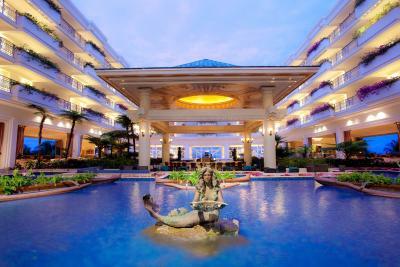 A separate adults-only pool and sun terrace is also offered. 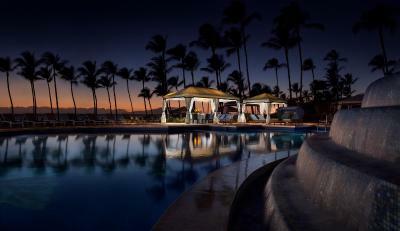 The Wailea Tennis Club features 11 tennis courts. A state-of-the-art fitness center is available to guests. 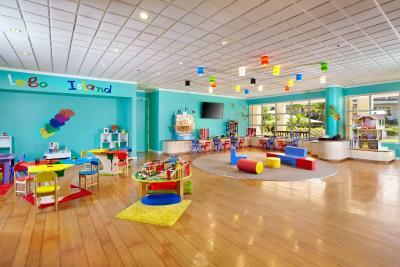 A children’s activity program includes lei making, crafts and video games in a separate activity center. 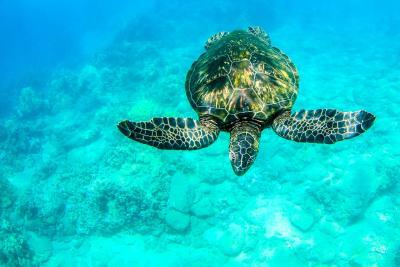 Guests can take advantage of the novice scuba lessons, yoga lessons on the beach, tours of the Botanical areas, cultural tours, and private photography sessions. Other services available include paddleboard lessons, guided standup paddle excursions, guided kayak tours, and the outrigger canoe experience. 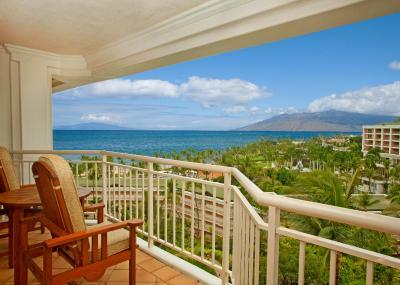 The Shops at Wailea are 5 minutes’ walk away. 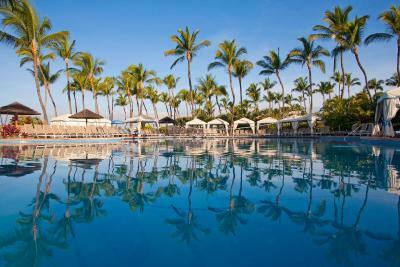 Kahului International Airport is 35 minutes’ drive away. 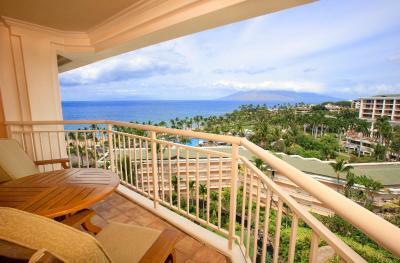 Old Lahaina Town is 30 mi away from Grand Wailea Resort Hotel & Spa. 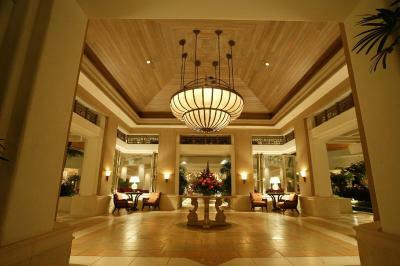 When would you like to stay at Grand Wailea Resort Hotel & Spa, A Waldorf Astoria Resort? 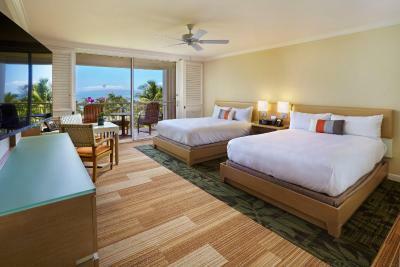 This room features a view of Mount Haleakala from a private terrace. Free Wi-Fi, a flat-screen TV, premium feather comforters, deep soak bathtub, plush bathrobes and slippers, designer toiletries, a makeup mirror and hairdryer are also available. This deluxe room features a view of the grounds from a private terrace. Free Wi-Fi, a flat-screen TV, premium feather comforters, deep soak bathtub, plush bathrobes and slippers, designer toiletries, a makeup mirror and hairdryer are also available. This room features a view of the ocean from a private terrace. Free Wi-Fi, a flat-screen TV, premium feather comforters, deep soak bathtub, plush bathrobes and slippers, designer toiletries, a makeup mirror and hairdryer are also available. This deluxe suite features a private terrace, small fridge, DVD player and coffee-making facilities. Free Wi-Fi, a flat-screen TV, premium feather comforters, deep soaking tub, plush bathrobes and slippers, designer toiletries, a makeup mirror and hairdryer are also included. This deluxe suite features a separate sitting area, private terrace with views of Mount Haleakala, small fridge, DVD player and coffee-making facilities in addition to the standard amenities. A dedicated concierge, access to two private lounges, continental breakfast, cocktails and hor d’oeuvres are included in this suite. A private terrace, separate sitting area, small fridge, wet bar, DVD player and coffee-making facilities are provided in addition to the standard amenities. A dedicated concierge, access to two private lounges, continental breakfast, cocktails and hor d’oeuvres are included in this luxurious suite. A private terrace with ocean views, separate sitting area, small fridge, wet bar, DVD player and coffee-making facilities are provided in addition to the standard amenities. This suite features a separate sitting area and private terrace. 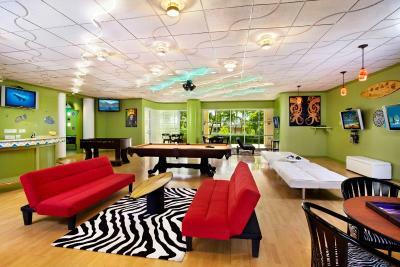 A small fridge, wet bar, DVD player and coffee-making facilities are provided in addition to the standard amenities. 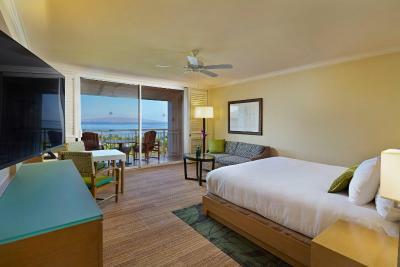 This deluxe room features unobstructed ocean views from a private terrace. Free Wi-Fi, a flat-screen TV, premium feather comforters, deep soak bathtub, plush bathrobes and slippers, designer toiletries, a makeup mirror and hairdryer are also available. 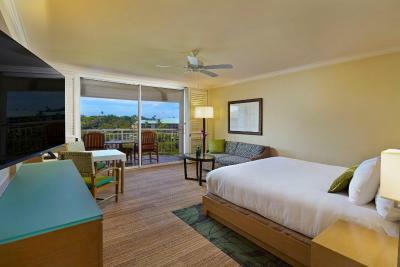 This room features a view of Mount Haleakala from a private terrace. Free Wi-Fi, a flat-screen TV, premium feather comforters, deep soak tub, plush bathrobes and slippers, designer toiletries, a makeup mirror and hairdryer are available in this room. Free Wi-Fi, a flat-screen TV, premium feather comforters, deep soaking tub, plush bathrobes and slippers, designer toiletries, a makeup mirror and hairdryer are included in this room. 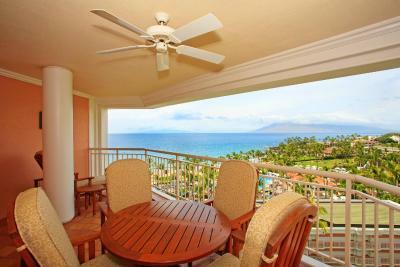 This room offers a private balcony or lanai, air conditioning, a coffee machine, a refrigerator, a 55-inch HDTV, a complimentary safe, ironing facilities, an electronics docking station, WiFi access, and an private bathroom with bathrobes and a walk-in shower and tub. 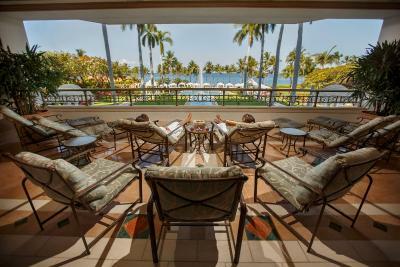 This Napua Club room offers access to two private lounges which includes a continental breakfast, light snacks, hors’d’oeuvres, full bar, champagne, and chocolates (adults only). Guests of the club units also can take advantage of the personal concierge services such as pool wristbands and private registration at the Napua Tower. 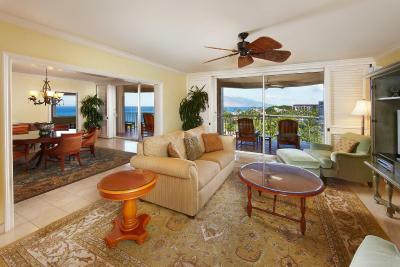 This suite is the largest suite available, at 5,500 square feet and with two bedrooms and two and a half bathrooms. This suite features a grand piano, a private lanai with garden and panoramic ocean views, a wet bar, a living room area, a dining area, a 55-inch HDTV, an electronics docking station, a complimentary safe, and WiFi access. An optional adjoining room is available to create a three-bedroom suite. 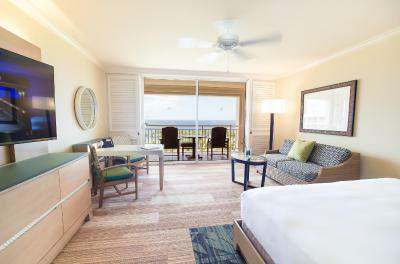 This room offers a private lanai, a coffee machine, a refrigerator, a 55-inch HDTV, an electronics docking station, a complimentary safe, WiFi access, and an private bathroom with a walk-in shower and tub and bathrobes. 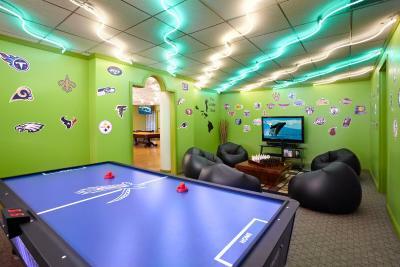 This Napua Club suite offers access to two private lounges which includes a continental breakfast, light snacks, hors’d’oeuvres, full bar, champagne, and chocolates (adults only). Guests of the club units also can take advantage of the personal concierge services such as pool wristbands and private registration at the Napua Tower. 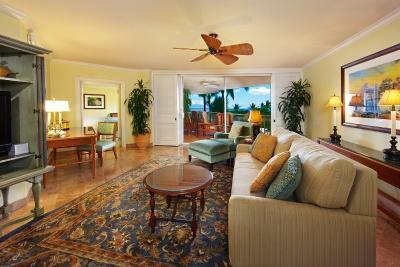 This suite offers a private lanai overlooking the garden as well as offers partial ocean views, a spacious living room area, a coffee machine, a refrigerator, a 55-inch HDTV, an electronics docking station, a complimentary safe, WiFi access, and an private bathroom with a walk-in shower and tub and bathrobes. 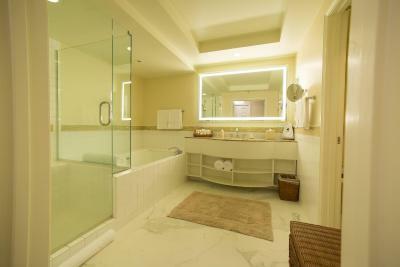 An additional half-bath is also available. 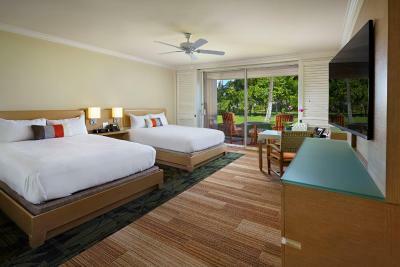 This garden view room offers a private lanai overlooking the garden, a coffee machine, a refrigerator, a 55-inch HDTV, an electronics docking station, a complimentary safe, WiFi access, and an private bathroom with a walk-in shower and tub and bathrobes. 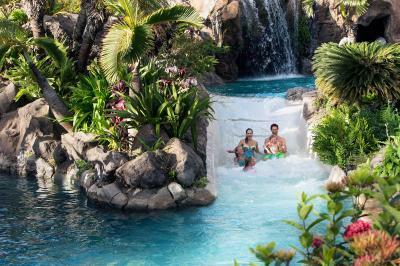 Set amidst waterfall gardens and winding pathways, this breathtaking luxury resort offers something for the whole family to enjoy including Spa Grande, Wailea Canyon Activity Pool featuring waterslides, rapids, and a rope swing, plus an ideal location within steps of Wailea Beach and a mile from championship golf and upscale shops. 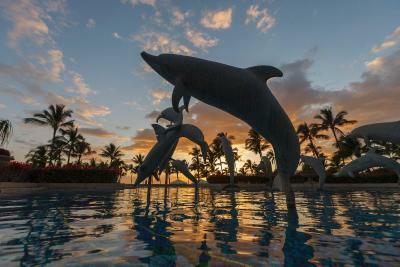 House Rules Grand Wailea Resort Hotel & Spa, A Waldorf Astoria Resort takes special requests – add in the next step! One child under 4 years is charged USD 50 per night when using existing beds. 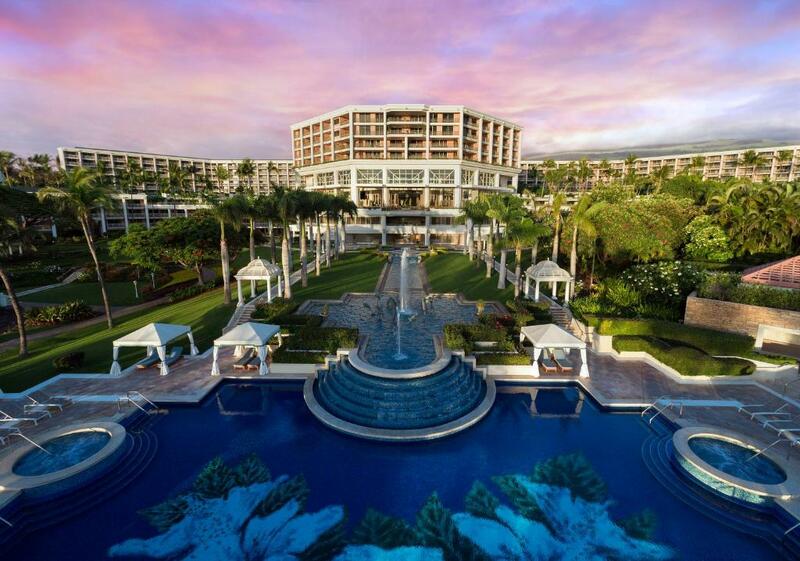 Grand Wailea Resort Hotel &amp; Spa, A Waldorf Astoria Resort accepts these cards and reserves the right to temporarily hold an amount prior to arrival. 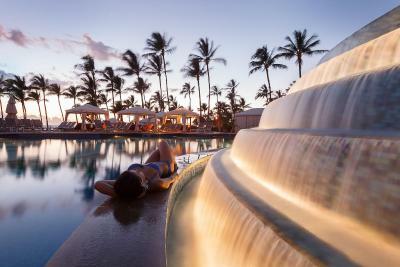 Grand Wailea Resort Hotel & Spa, A Waldorf Astoria Resort accepts these cards and reserves the right to temporarily hold an amount prior to arrival. Please note: Only the "Breakfast Included" rate includes a daily breakfast for 2 adults.